It is easy to dismiss ekphrastic poetry. Long favored by middle school creative writing classes and poetry workshop challenges, it is tempting to exile the ekphrastic poem to the ignoble and ignorable province of light verse. Then someone mentions Auden’s “Musee de Beaux Arts”, Keats’s “Ode on a Grecian Urn” or William Carlos Williams’ “Landscape with the Fall of Icarus.” We remember that in poetry, as much as any art form, the chasm between the pedestrian and the brilliant is wide but there is room for both. At its best, an ekphrastic poem does much more than tell us about a painting. It zeroes in on what the artist was doing (perhaps unintentionally) and through that, may tell us even more about the world and ourselves than the original work alone. This often requires the poet to get very personal with the artwork. The visual art on which the poems are based ranges from the familiar (Wyeth’s Christina’s World) to the more obscure (Tanguy’s Les Vues) to the unexpected (the statue of Rocky outside the Philadelphia Spectrum). Vines’s subjects are primarily 20th Century paintings, including those by Rothko, Picasso, Rauschenberg and Warhol. These works, some of which represent the psyche rather than visual objects, lend themselves to the varied approaches he takes. While some poems describe and interpret specific works, others use the work as a touchstone for poems that, if no painting were mentioned, would satisfy. Resort to the visual inspiration only heightens the effect, as the reader sees that Vines is giving us at once his personal interpretation and following the direction of the artist to something universal. Still others use the reactions of viewers to delve into the meaning of the painting. “The Iconoclasts” uses the reaction of four boys at a museum to Indiana’s “American Dream #1” to amplify exactly the view of America the painter had in mind. Unimpressed with Rauschenberg’s Rebus the boys take out their frustration and boredom by pretending to “dump banana clips and drum/ magazines” into the bullseye-like icons on Indiana’s painting. The recent flood of school shootings make this poem almost unbearably timely and true. Mr. Vines is an assistant professor at UAB and editor of The Birmingham Poetry Review. 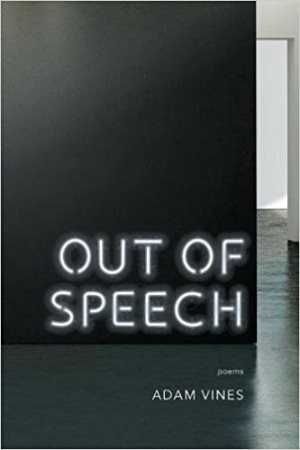 Out of Speech is the rare work that should satisfy both the demanding academic and the avid reader of poetry. While it may not make the reader a fan of ekphrasis, it is an example of what can be done when remembering to include the viewer in what is being viewed. Barry Marks is a Birmingham attorney, a past President of the Alabama State Poetry Society and a member of the Board of Directors of the Alabama Writers Forum.